I discovered a wonderful book that is literally a master class on the baking of rye breads. The book is called The Rye Baker by Stanley Ginsberg. Mr. Ginsberg offers not only techniques but a history of the grains along with over 70 classic recipes from all over the world. This bread journey includes the chemistry of sours, soakers, sponges and scalds. If you are a baker and a bread lover you will want this book in home library. If you think you can’t make bread , I beg to differ. 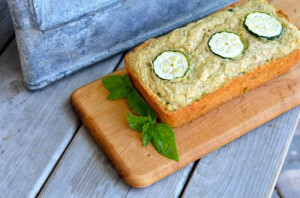 The recipe below was developed by Mr. Ginsberg for The Splendid Table and it’s incredibly easy to make with delicious results. There is very little active time in the preparation and the results are amazing. 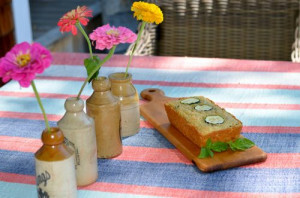 The aroma of fresh bread will delight you and then taking a slice of your homemade bread will be sheer heaven. I find if you wrap the bread well it will keep well for the next day and after that it’s the perfect slice of toast. From by the bay wishing you delightful rye bread food memories! Note: I found better results with the bread rising by mixing first into a bowl the yeast, sugar and cider for approximately 15 minutes and then adding the remaining ingredients. Also, depending on the temperature of your kitchen you may need additional time for the dough to rise. Recipe by Stanley Ginsburg author of The Rye Baker, Classic breads from Europe and America, as featured for The Splendid Table. 1. Combine all the ingredients in a mixer and use the dough hook to mix on low until the dough is evenly blended, 6-8 minutes. If mixing by hand, 10-12 minutes. 2. Cover the bowl and let the dough rise at room temperature until doubled in volume, about 1 hour. 3. Turn the dough onto a floured work surface, divide in two and shape each piece into a flattened ball. Place the loaves on a parchment lined sheet-pan, cover and let rise at room temperature until the surface shows cracks, about 1 hour. 4. Preheat the oven to 400°F, use a sharp knife to slash the loaves and bake until it thumps when tapped with a finger, 45-50 minutes. Transfer to a rack and cool thoroughly before slicing. 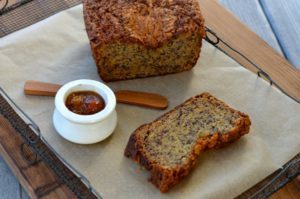 This entry was posted in Bread and tagged hard cider recipes, normandy cider rye bread, rye bread, rye flour, Stanley Ginsburg, The Rye Baker, The Splendid Table, yeast on March 26, 2017 by entertainingbythebay. It’s summer and one of the perfect canvases for a summer meal is the reliable pita bread! Let’s all remember my mother is Greek!! Last weekend, I decided to tackle homemade pita bread, thinking it was a big chore and difficult to do, much to my surprise it was super easy. I know you’re thinking really how is this easy? It’s 5 steps – measure, mix, rise, pull and grill. If you are like me , how many times have you watched Bobby Flay make flatbread or pizza or pita on the grill and wonder how is this not a mess. I’m here to tell you , Bobby speaks the truth when he says it’s easy. The key is to put the dough on the grill and let it bake a a minute or two. The dough pulls away naturally once it’s baked. The taste of home made pita is so superior to store brought you will want to give this a try! I’ll have a few recipes coming up that is the perfect complement to homemade pita! Yum!! From by the bay, wishing you perfect pita food memories! 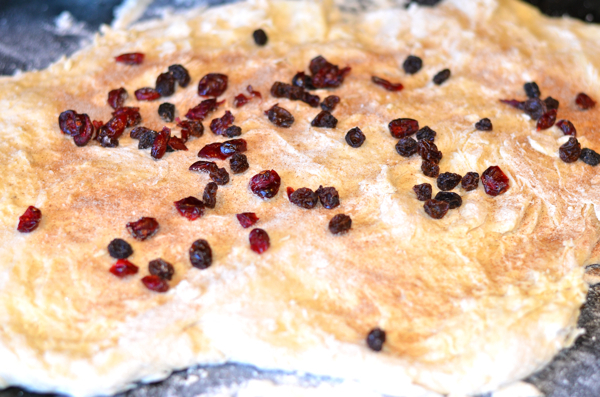 To prepare this pitta bread recipe start by sieving the flour into your mixer’s bowl. Add the yeast, sugar and salt and blend with a spoon. Add a little bit of water and start mixing, using the dough hook. Pour in the water a little bit at a time, at a steady stream, whilst mixing. Wait each time for the water to be absorbed and continue adding some more. 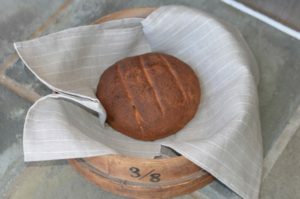 Depending on the flour, the dough may or may need a little bit less water than this pita bread recipe calls for. After mixing for a while, the dough for your pita bread should become an elastic ball. If the dough is still crumbled, you should add some more water. If it becomes too sticky, this means that you added more water than needed. In that case, add 1 tsp of flour and continue mixing. When done, cover the dough with plastic wrap and let it sit in a warm place, for at least 1 hour, until it doubles its size. This is an important step for this pita bread recipe, so that the pita bread becomes fluffy and soft. Take the dough out of the bowl and knead a little bit with your hands. Split in 6 evenly sized portions. To form the pita bread, you can either use a rolling pin, or stretch it with your hands for a more rustic look (and my preference actually ), about 1/4 inch thick. Heat an outdoor grill. Put the stretched dough on the grill and close the cover. Let bake a minute or two and flip the bread. Grill another minute and remove. If you don’t want to use the grill – heat a non-sticking frying pan to medium-high heat (with no grease) and fry each pita bread for about 3-4 minutes on each side, until slightly colored and still soft. To give more color, push the pita bread with a wooden spoon on the pan. Remove the serve. 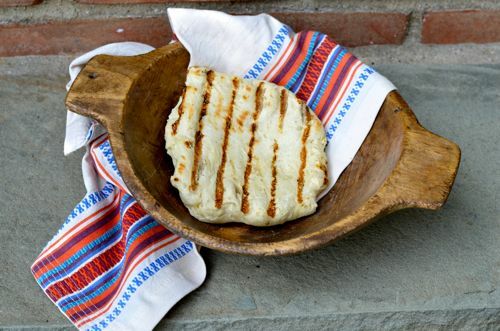 This entry was posted in Bread and tagged baking, easy bread recipe, flatbread recipe, Greek food, Greek recipes, grilled foods, homemade pita bread, yeast on May 27, 2015 by entertainingbythebay. In a bowl dissolve sugar in 1 ½ cup hot water, then add the yeast cover with a towel and set aside for 10 minutes. The mixture should start to foam. Add 3 cups of flour mix and turn dough onto floured surface. 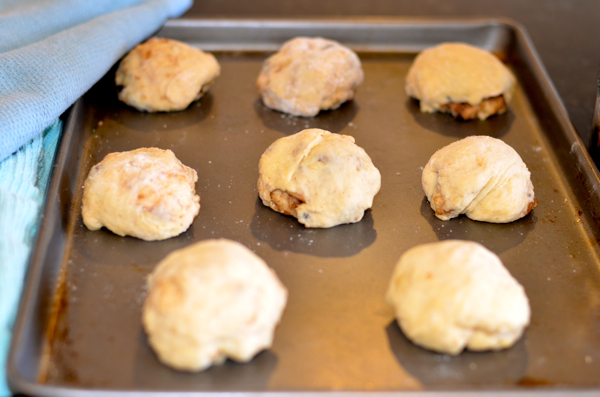 Put some flour on top of the dough and on your hands and knead for about 5 minutes. As you work the dough add enough flour to make the dough less tacky. After kneading, spray a bowl with cooking oil. Place dough into bowl. Spray the top of dough with more cooking oil spray. Cover the bowl with a moist dishtowel and place to the side to rise for 1 1/2hr. The dough should be double in size. Punch the dough down. Take a non stick rimmed cooking sheet 9” x 13”, spray lightly with cooking oil and spread dough out to the size of the pan. Cover with damp dishtowel and let rise again for 30 minutes. Take a sauté pan to medium flame add butter. To melted butter add the sliced onions and fennel, ½ tsp salt and ¼ tsp pepper and cook until brown and caramelized stirring frequently not to burn, approximately 15 minutes. Add the fennel seed and let cool. Preheat over to 425F , take the cooking sheet with dough and using finger tips press into the dough making dimples. Spread the onion fennel mixture over the top leaving 1 inch not covered around the perimeter of the pan. Next added the grated cheese and the grey sea salt. Place in oven and bake for 25 minutes until golden brown. Serve warm or room temperature. 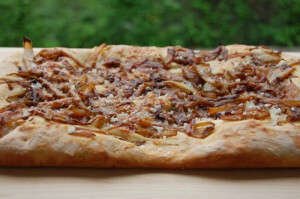 This entry was posted in Bread and tagged baking, bread recipes, cocktail party recipes, entertaining recipes, fennel recipes, foccacia recipes, italian food, italian recipes, onion recipes, snack on May 25, 2014 by entertainingbythebay. I discovered this easy no knead flatbread recipe while on the King Arthur Flour website. It’s a perfect summer bread recipe since it requires no kneading – it’s simple, easy and tasty. So when my sister Diane phoned one Saturday afternoon saying she was stopping by, I didn’t have to go much further than my pantry and herb garden to come up with a delicious and playful topping for my flatbread. 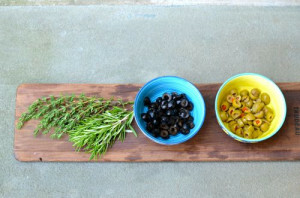 I mixed two types of olives, slicing them into little rounds to create the base of my topping. To that I added some fresh mixed chopped herbs from my garden, using my favorites rosemary and thyme and along with that some anchovy paste for some saltiness and depth of flavor. I keep a tube of anchovy paste in the fridge to use when I want to add an unexpected flavor to a dish, it’s especially great for salad dressings. 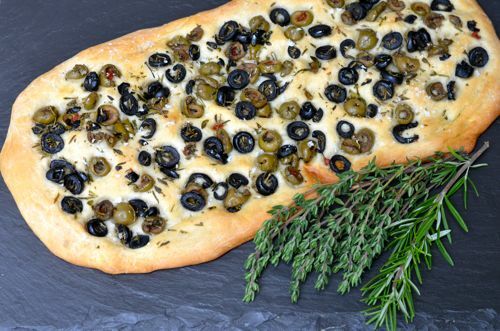 The end result was a savory and beautiful flatbread that looked as if it was covered with a confetti of olives! The bread is perfect as a little snack or the centerpiece for a cocktail party surrounded with a cheese or two. It was just the right thing for our afternoon visit. From by the bay wishing you some playful food memories! Preheat oven to 375 degrees F. Grease a 9″x 13″ with olive oil. Take the flatbread dough and spread out on the pan, it should cover about 2/3 of the pan. Cover with plastic wrap and let rise for an hour. While the dough is rising place all the ingredients into bowl, except the sea salt and mix. Once the dough has risen place the topping over the dough. Press topping gently into the dough and then sprinkle with sea salt. Place in the oven and bake for 35 to 40 minutes. Remove from oven and serve warm or at room temperature. Place all ingredients into the bowl of an electric mixer. At a low speed first combine the ingredients, slowly increase the speed to high and mix for about 1 minute. Grease a 9″x 13″ with olive oil. Take the flatbread dough and spread out on to the pan, it should cover about 2/3 of the pan. Cover with plastic wrap and let rise for an hour. Place in the oven and bake for 35 to 40 minutes. Remove from oven and serve warm or at room temperature. This entry was posted in Bread and tagged bread recipes, herb recipes, King Arthur Flour, no knead flat bread recipe, olive recipes, party foods, rosemary recipes on May 25, 2014 by entertainingbythebay. Last month , I was headed into another early morning meeting at work. I had the good fortune to be meeting with someone who is very thoughtful. 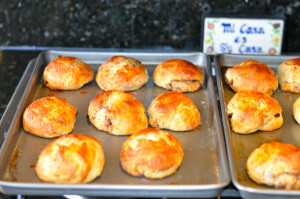 That morning , she welcomed me with a delightful treat, two delicious brazilian cheese puffs. This was my first time tasting this yummy, light and airy bread. 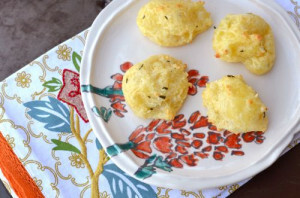 They are crispy on the outside and soft and cheesy on the inside. When I arrived home by the bay that weekend, my sister Nancy welcomed me with the same little treat. Amazing to spend your whole life unaware of something so good and then you experience it twice in one week . 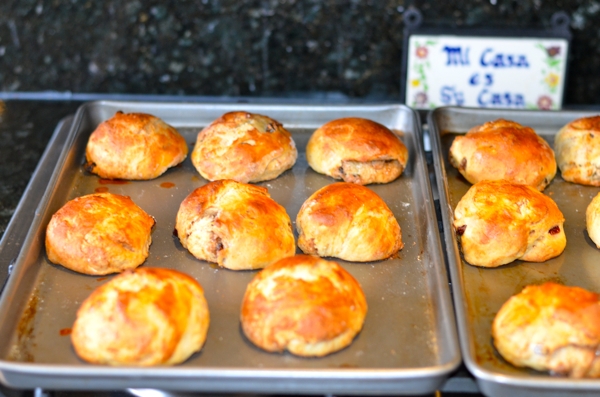 I knew then, i needed to figure out to make these little breads myself. So this is the recipe and technique that worked best for me. It’s a hybrid of several recipes I tried. 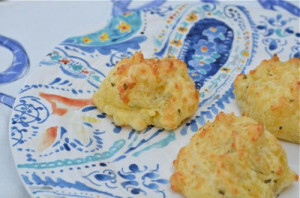 You can make these in a large size and serve for breakfast ( do adjust the baking time if you do that) or make them in a small bite size as an appetizer to serve along with your favorite wine or cocktail. 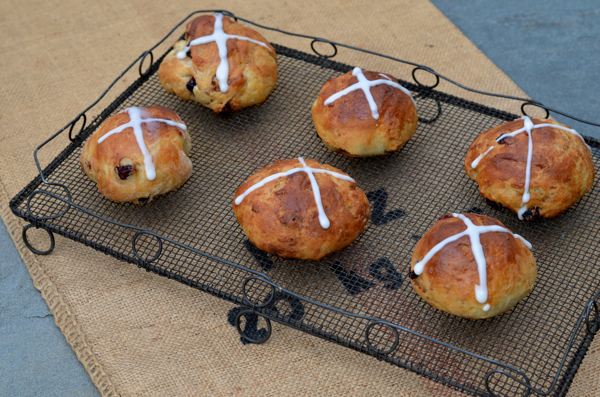 These are pretty easy to make and definitely worth the time and effort. From by the bay, wishing you cheesy food memories! * Tapioca Flour can be found at specialty markets such as Whole Foods or Asian markets and is also called manioc starch or tapioca starch. Preheat oven to 450 degrees F. Line two baking sheets with parchment paper. 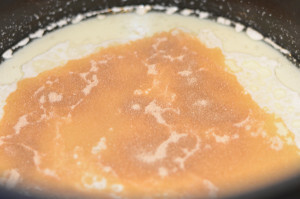 In a medium sauce pan, bring the milk, salt, and butter to a boil, stirring occasionally. Once the mixture starts to boil remove from heat. Slowly add tapioca flour, stirring constantly until thoroughly mixed. The dough will be somewhat gummy at this point. Transfer the dough to a standing mixer fitted with a paddle attachement. Beat the dough for a few minutes until it smooths out. Whisk the eggs in a small bowl and add into the dough 1/2 at a time . Make sure the egg is incorporated into the dough before adding the rest of the egg. With the mixer on medium, beat in the cheese and rosemary until incorporated. Round out the dough onto the parchment lined baking sheet into little mounds spaced apart about 2 inches. Approximately 10 per tray. Place in the oven and immediately turn down the heat to 350 degrees F. Bake for 25 to 30 minutes. 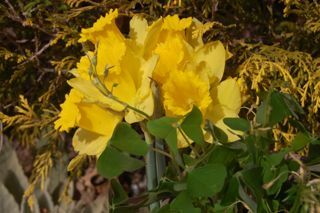 They will puff, look dry on the outside and start to turn color. Cool slightly and eat warm.Cooked puffs can be stored, in the fridge as long as it’s kept covered and then reheat in the microwave. note: I like to mixed my parmesan cheese 1/2 grated and 1/2 shredded for a little more texture. You can also use thyme in place of rosemary or add some mixed garlic in place of the herbs. If you like things spicy, substitute the parmesan cheese for cheddar and replace the rosemary with minced fresh jalapeno. This entry was posted in Bread and tagged brazilian recipes, cheese puff recipes, gluten free recipes, parmesan recipes on May 25, 2014 by entertainingbythebay. This is the perfect Christmas breakfast. Let me specify that I do not use the word perfect lightly!!!! This breakfast is inspired by two of my favorite cooks, Nigella Lawson and Ina Garten, so how perfect is that! Last Christmas as I settled in with some cookbooks on a snowy night, I reread one of my favorite books from Nigella Lawson, “Feast – Food To Celebrate”. Tucked away in the book was a recipe within a recipe for cranberry jam and I just had to make it! Now, I always had a fear of making jam of any kind. My first reason was a fear of using pectin My second reason was another fear, the fear of canning. I would worry that I wouldn’t seal the jars properly. Nigella’s cranberry jam is so easy that my fears just faded away and the results were delicious! Cranberries are filled naturally with pectin, so making this jam is almost as easy as boiling water. I decided to just refrigerate the jam the way I do cranberry sauce and that decision saved the whole stress about sealing the jars properly. 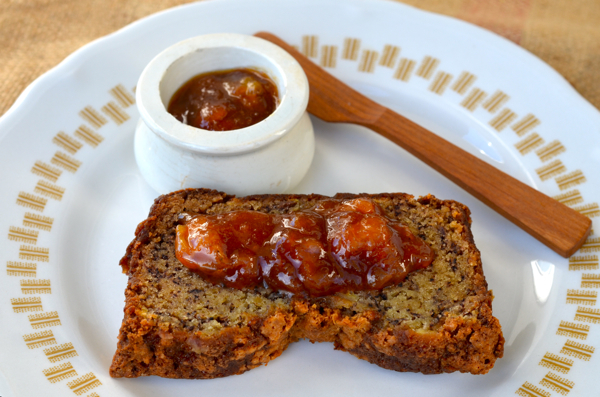 I made this jam last Christmas morning and it disappeared as quickly as Santa did up the chimney. 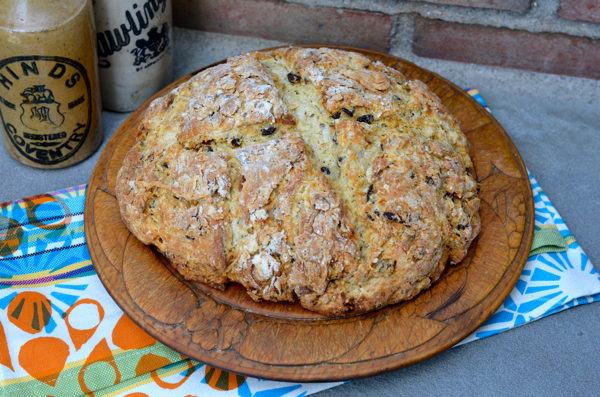 I did have the perfect accompaniment to the jam that morning Irish Soda Bread without the raisins. I use Ina Garten’s recipe because , why fool around with perfection. The only change I made is one that I always do , I switch the raisins to dried cranberries. This switch is a result of the fact that my sister Nancy hates raisins and she loves dried cranberries. I have to tell you that once I switched, there was no going back. You need to try this bread. 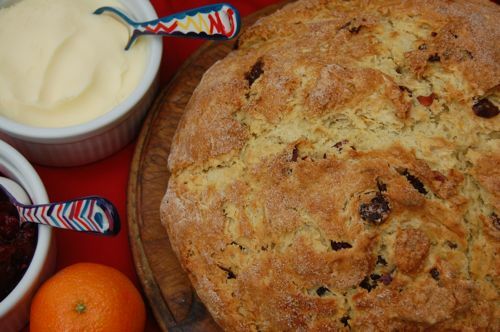 Nothing beats the combination of warm cranberry soda bread topped with cranberry jam. It screams Christmas, holidays and that something really special is going on. Enjoy – tis’ the season! From by the bay, wishing you very cranberry food memories! Adapted from Ina Garten’s Irish Soda Bread from “Barefoot Contessa At Home” published in 2006. Dump the dough onto a well-floured board and knead it a few times into a round loaf. Place the loaf on the prepared sheet pan and lightly cut an X into the top of the bread with a serrated knife. 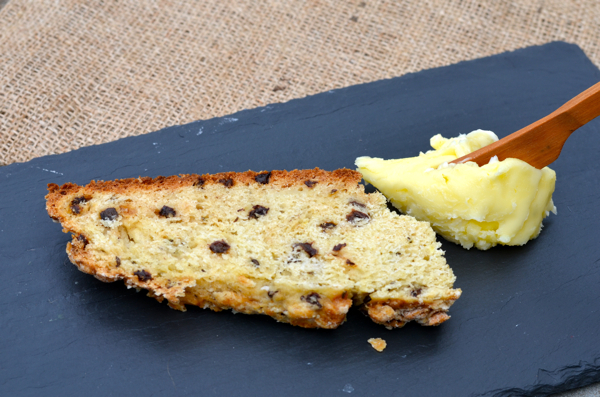 Bake for 45 to 55 minutes, or until a cake tester comes out clean. When you tap the loaf, it will have a hollow sound. Pour the jam into a sterilized jar (s) and seal immediately or keep in the refrigerator for 1 week. This entry was posted in Bread and tagged breakfast recipes, cranberry irish soda bread recipe, cranberry jam recipes, cranberry recipes, holiday food, holiday recipes, Ina Garten, irish soda bread recipes, jam recipes, Nigella Lawson on May 24, 2014 by entertainingbythebay.